While perusing eBay's treasures today, I found this photo of Jimmy Wong. 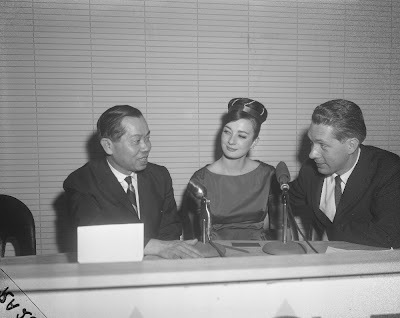 From seller's caption: "Jimmy Wong, Pat Stevens studio model, Ondine, and Del Clark of WRSV FM 98.3 Skokie, Illinois. Del was interviewing restaurateur Jimmy Wong in one of his restaurants at 3058 W. Peterson, December 22, 1964. Jimmy Wong's restaurants were often called "the most publicized" in Chicago, but Jimmy Wong, entrepreneur and host, was more than a media-savvy businessman." According to Wikipedia: "Chicago restaurateur Jimmy Wong bought property in the [Uptown] area in the 1960s and planned its rebirth as New Chinatown. He envisioned a mall with pagodas, trees and reflecting ponds to replace the empty storefronts. The Hip Sing Association, a Chinese cultural group, moved its Chicago offices to Argyle street in 1971, and by 1974 Wong and the Hip Sing Association owned 80% of the three-block stretch on Argyle. Wong had an accident and broke both hips, leaving him unable to follow through on his plans. In 1979 Charlie Soo, founder of the Asian American Small Business Association, took up the cause, and the area developed not solely as a Chinese enclave but also including Vietnamese, Laotian, Cambodian, and Japanese businesses." You can also see Jimmy Wong, along with Ald. Volini and Charlie Soo, in the 1960-1980 portal of the Roots of Argyle Mural. To read more about the Argyle Mural, go here: Roots of Argyle. "The entire Uptown community is grateful for his contribution," said Ald. Mary Ann Smith (48th). "He was the first one and, for a long time, the only one to have faith that good things could be established here. Because he set down roots here, eventually others followed. He reached out to a whole generation of new immigrants and helped them build their lives here."